She watched some online videos, grabbed some wire cutters and got to work. A squirrel named Bucky is back to chomping on seeds and nuts after a woman on a ranch northwest of Edmonton was able to cut back his overgrown teeth. BARRHEAD, Alta. 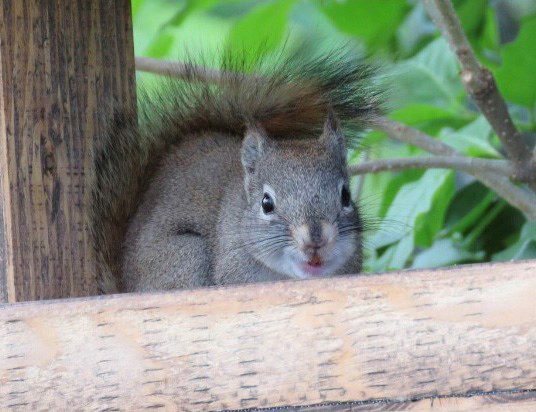 — A squirrel named Bucky is back to chomping on seeds and nuts after a woman on a ranch northwest of Edmonton was able to cut back his overgrown teeth. Jannet Talbott, of the Double J Freedom Ranch near Barrhead, noticed the squirrel was quite thin and suspects the only thing he could eat was ground-up finch food she puts in her feeders. One of the rodent's bottom incisors had grown so long it had curled out past its cheek and dangerously close to one eye. Talbott says she was working in her yard recently when she spotted Bucky with his back to her as he sat in one of her feeders. "I knew it was my best chance (to catch him.) I saw him in there and decided I had to help this squirrel." Luckily, she was already wearing leather gloves, so she grabbed the toothy rodent from behind and brought him into her house. She swaddled him in a towel and that's when she saw that Bucky's dental woes were much worse than she thought. All his upper and lower incisors were overgrown and some were curling into his mouth. "He couldn't live much longer the way he was because he couldn't close his mouth. He couldn't actually chew his food." Talbott quickly researched some basic squirrel dentistry, watched an instructional video on the internet and got to work with some wire cutters. Squirrels don't have nerves in their teeth so they can't feel any pain. She says Bucky remained totally chill while she worked on him. "Didn't squirm. Didn't move. I do believe animals know when you're trying to help them." Once she let him back outside, he raced up a tree and continually rubbed his cheeks on the bark as if delighted with his new smile. Bucky, after Jannet Talbott performed her DIY dental surgery. "He's doing fantastic. He's back in the feeder and this time he's actually eating nuts instead of ground-up finch food." A squirrel's four incisors don't stop growing and are kept worn down when the animal gnaws on nutshells, acorns and bark. Talbott thinks Bucky may have a bad bite so his teeth don't naturally grind down. She says she'll keep an eye on him. "If I have to, I'll certainly help him again." Talbott has been helping animals since she was a child. She says she would bring anything that walked, crawled or flew into the house. She now has five Mexican rescue dogs and has found homes for 40 others. "I really hope to inspire others to help an animal in need when the opportunity presents itself."